Beautiful One Bedroom in Heritage Neighbourhood. Walk to town and amenities. 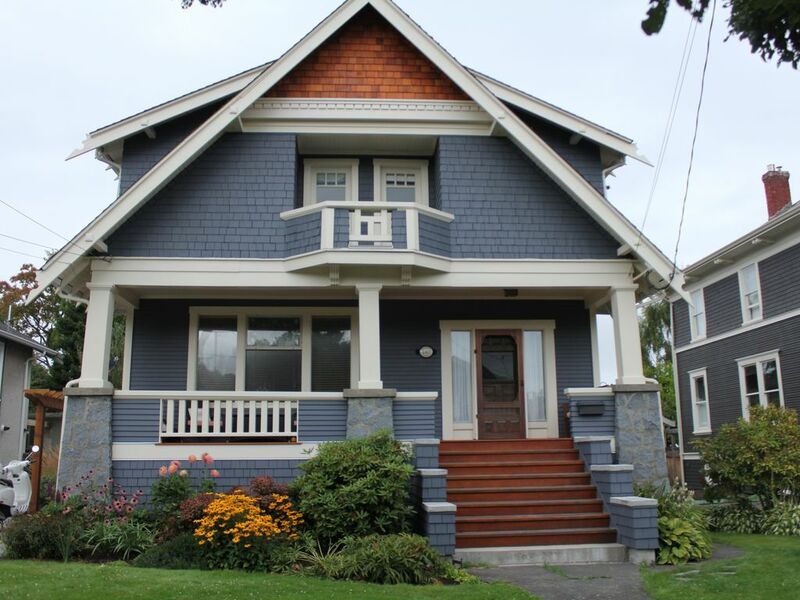 One bedroom in a beautiful 1912 character home in the heart of the City of Victoria (Business Licence No. 00034720). Located one block from the ocean and a 15 minute walk to downtown. Conveniently located close to Cook St. Village (5 min walk) where you will find a variety of restaurants, shops and markets. This bright and spacious lower level unit offers 1 bedroom, 1 bathroom, fully equipped kitchen, dining area, living room, electric fireplace, two flat screen televisions (one with cable, one with Apple TV only), computer, high-speed wireless internet, in suite washer and dryer and more. The master bedroom offers a double bed, 40' LCD wall mounted television (with Apple TV) and a good size closet. The living room is bright and cozy with views of the garden. There is an electric fireplace, 40' LCD television (cable) and sofa bed. The kitchen is an open concept layout and is fully equipped for all your cooking needs. The house is located in a quiet Fairfield neighbourhood. It is within walking distance to grocery stores, a beer and wine store, pubs and restaurants, coffee shops and Victoria’s famous inner harbour. If you want to escape the city life, you can visit Beacon Hill Park (less than 5 minute walk), Craighdarroch Castle, Buchart Gardens, Sooke, world class golf courses and more. All are just a short walk, drive or bus ride away. We generally require an initial rental deposit payment of 50% of the rental fee at the time of booking. The remaining 50% is due 30 days before the rental commences. Effective October 1, 2018, municipal (8% PST) and municipal/regional district (3% MRDT) taxes apply to rental accommodations in BC. Stays for a continuous period of 27 days or more will be exempt from the new PST/MRDT; taxes will be waived for long stay accommodations of 27 days or more. We do include a cancellation policy in our rental agreements with our Guests. Once the reservation has been accepted and confirmed, a cancellation refund will be paid if the period of the rental can be rebooked (i.e., a refund for the period re-rented or the part thereof will be issued). How big is the bed in the bedroom? The bed in the bedroom is an Ikea Double (55' x 78') which is between a Standard Double (54' x 75') and a Standard Queen (60' x 80'). There are three groceries nearby. Thrifty Foods ) is less than 1 km away and is the one use most often. There is also Oxford Foods and Mother Natures Market and Deli in Cook Street Village. Both are easy walking distance. There is also a farmers' market about 10 minutes walk from us on Saturdays mornings all summer and fall. Do you have room to store our bikes? We do have space to safely store 4 bicycles. Is there cable TV service in the Suite? Yes. There are two flat screen TVs. The TV in the living room has cable. The TV in the bedroom has only Apple TV/Netflix. There is also a computer available where Guests can access local news. What's the trick to getting the Apple TV to work? For the main TV: 1. Turn on the TV using the main remote. 2. Make sure the Input is on 'Cable'. 3. Push the round centre button on the Apple TV remote. This turns the unit on. 4. Scroll on the Apple TV menu using the arrow buttons on the silver remote to search Netflix. 5. Push the round centre button the Apple TV remote to select and play the show you want to watch. For the TV in the bedroom. Same as above except the Input is "No. 6" instead of 'Cable'. As always, please contact the Homeowner if you have any difficulties. newly renovated bathroom with heated floors. Large shower with rain shower and traditional shower head. Both the living room and the bedroom have apple tv with access to Netflix. small garden available for relaxing and reading a book. Wonderful location. Very well equipped space. Had trouble staying warm. Thanks for a wonderful stay! We really enjoyed the suite. It was nice having a heated floor in the bathroom and a very modern bathroom. The kitchen was well-equipped. It is also a great place for a dog. Our main problem was with the heating. It was a very cold in Victoria during our stay, much colder than most winters. The heat came in from the vents high up in the wall but the temperature profile was vertically stratified (warm up high and cold down low) and so the floor and walls remained quite cold. It was good to have internet and Netflix although we lost the connection from time to time. However overall it was a positive experience. Not too many VRBO's would accommodate us and our dog. These owners were very willing, which we really appreciated. The only negative for us, was the internet was not consistent, other than that, everything was great. Hi Maureen and Bob. Thanks for your kind review. Always happy to have good dog owners and good dogs like yours. We do have a dedicated WiFi for our Guests and we are happy to reset the router if it starts to slow down or is inconsistent. It's always a challenge to keep up with the fastest Internet service and we will take another look at that. Thanks and safe travels. We spent the summer in the Libella Suite having an in province vacation. It is a perfect location: just a few minutes walk to the Dallas Road ocean path which is an off leash dog area and very dog friendly. Also an easy walk to Beacon Hill Park which offers beautiful walks and gardens throughout the summer. Cook Street Village, a 10 minute walk, has everything you need including good restaurants, shopping, coffee bars and more. The suite is a self-contained basement suite with a private entrance through the lovely back garden. In spite of being in the basement there are large windows that let in enough light to make the suite bright. The owners who live upstairs were responsive to all our needs and very accommodating with special requests. The bathroom has been updated with heated floor and clean white fixtures. All appliances are in good working order. We would definitely recommend Libella Suite with confidence. Thanks for your kind review. Looking forward to seeing you again. My boyfriend and I stayed here for 5 nights and it was a great place to stay! We were really happy with everything and have no complaints about anything. We read in previous reviews that people were upset by the owners walking around upstairs, however it really did not bother us as we are both used to that sort of thing. The owners were really accommodating and really allow for complete privacy if that's what you wanted. It was nice that really basic stuff was in the suite like shampoo/conditioner/body wash, all things cooking, blankets, etc. The house was also super close to Cook street village (5 minute walk) and the ocean (5 minute walk) which made this stay even sweeter. Thank you so so so much! 10/10 will definitely return. Thanks for your kind review. We are happy you enjoyed your visit. Welcome back anytime. This is a clean, quiet suite with a great little kitchen & living area. The location is fantastic, very close to Cook Street Village, Beacon Hill Park, Downtown, and the Ocean along Dallas Rd. Clean, bright and spacious basement apartment in a beautiful heritage home.During my stay I enjoyed walking to Dallas Beach Road, Cook Street Village and downtown Victoria with its many sights and amenities. I appreciated the beautiful gardens and homes in this neighbourhood on my walks. Groceries are available in Cook Street Vlllage The apartment is very private with its own entrance. I was staying here alone while visiting family but it could easily accommodate two couples or a family. Alan was available if there was a need. He responded very quickly to solve a minor problem of a missing remote and made me aware in advance of a planned power outage so that I could be prepared. I would definitely consider booking again when I return to Victoria and would recommend this apartment to anyone who likes to get away from the hustle and bustle of the city centre. See Rental Agreement Once a reservation has been accepted and confirmed, a cancellation can only be made in accordance with the terms below: - 100% refund for cancellations more than 30 days before your check-in date. - 50% refund for cancellations more than 14 days before your check-in date; if the cancelled period of rental can be re-booked, a 100% refund for the period re-rented will be provided. - Cancellations 14 days or fewer before your check-in date are non refundable; if the cancelled period of rental can be re-booked, a 100% refund for the period re-rented will be provided.